TWOBULLS BLACK LABEL 17 is formulated specifically for Performance Bulls. This feed additive will enhance and magnify the results you will get with a balanced feed program. TWOBULLS BLACK LABEL 17 succeeds the TwoBulls Black Label as our latest Generation of Performance Nutrition Supplement. TWOBULLS BLACK LABEL 17 was developed with the latest Nutrition Research and Technology with only premium ingredients to maximize the level of performance and health of your animal athletes. TWOBULLS BLACK LABEL 17 is formulated with proprietary Rumen Protected SQM Trace Minerals, Lysine, and Vitamin C, along with Arginine, Omega 3’s, and Bovamine Defend Probiotics to maximize absorption and availability to power your Bulls. No longer will you have to add multiple supplements, vitamins, minerals, and secret ingredients to your feed each day, we’ve already included them in each scoop of TWOBULLS BLACK LABEL 17. When your Bull feels better it performs better. 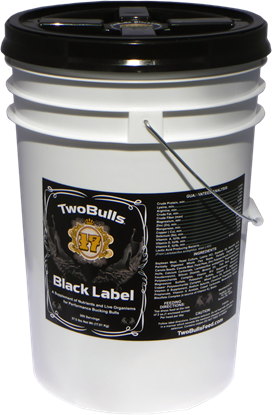 TwoBulls Black Label 17 is recommended for all Bulls in training, competition or on the road bucking. TWOBULLS BLACK LABEL 17 has been proven at the highest levels of competition in Futurities, Derbies, Classics, and the PBR. TWOBULLS BLACK LABEL 17 performs multiple functions that are essential to the health and performance of your animal athlete. Top dress feed at the rate of 2 oz. (1 enclosed scoop) per head per day. We have been testing the Black Label TwoBulls for over a month now. I have used it on yearlings, two year olds, three year olds and on my mature bulls. Since introducing the new product my bulls eat all their feed, even on the road. I have seen more attitude, strength and muscle tone. Their energy level is more than twice what it used to be. I have used TwoBulls for a long time and will be changing over to the Black Label. My bulls love it and so do I. "If you are looking for a product to improve muscle mass, energy, and performance TwoBulls Black Label is for you"
I’ve seen great results with TwoBulls Black Label. My bulls have a very noticeable increase in energy levels, they go straight to feed and lick the feed pan clean, and I am very pleased with overall performance. Within a few days after I started feeding the Black Label supplement I noticed a big change in my bulls’ energy levels. Older bulls that had been hauled a bunch and were used to the everyday routine started acting like young bulls in the exercise pen bucking, kicking, and running around. Muscle mass increased and their belly decreased. I would highly recommend this product. The Black Label product from Two Bulls Supplements has definitely made a name for itself in my book. Using the TwoBulls for over a year now has changed my bulls, but with the new Black Label product I have seen a huge difference in my bulls; their attitudes, energy levels and their performances. If you haven't tried it yet, I highly recommend it to anyone!" Barker Bulls has currently been testing a few bulls on the TwoBulls Black Label product for the past month now. This letter is to inform you that we have had nothing but great results from your product. We were able to notice changes within the first two weeks, mostly in muscle building and energy levels. The performances of the test bulls have also benefited in such aspects as intensity and power. So far, the only side effect would be the bellowing. However, I would consider this a sign that their energy levels are higher and that they are feeling good. Anyway, we just wanted to inform you that this is a very promising product, and we believe it will be the next big thing on the market today. We are ready to place an order as soon as it is released!!! When we at the Rockin T Ranch started using the Two Bulls Black Label supplement we immediately saw results. We saw eagerness with their eating habits, balanced digestive health, and consistent energy levels. We feel this supplement puts our bulls at the top of their game. I have been a firm believer in TwoBulls supplement for many, many years... When Jim approached me about trying the new TwoBulls Black Label product I was more than on board. Roy and Mr. Bull are both bulls that do not handle eating well on the road -- since starting this new formula, both bulls have been eating well on the road and getting the very best out of their feed. Not only are they eating well, they're behavior and playfulness while exercising has since increased! Not only from an exercise and feed intake standpoint, their performance level is peaking! Thank you, Jim, for allowing TwoBulls to be a part of my program!